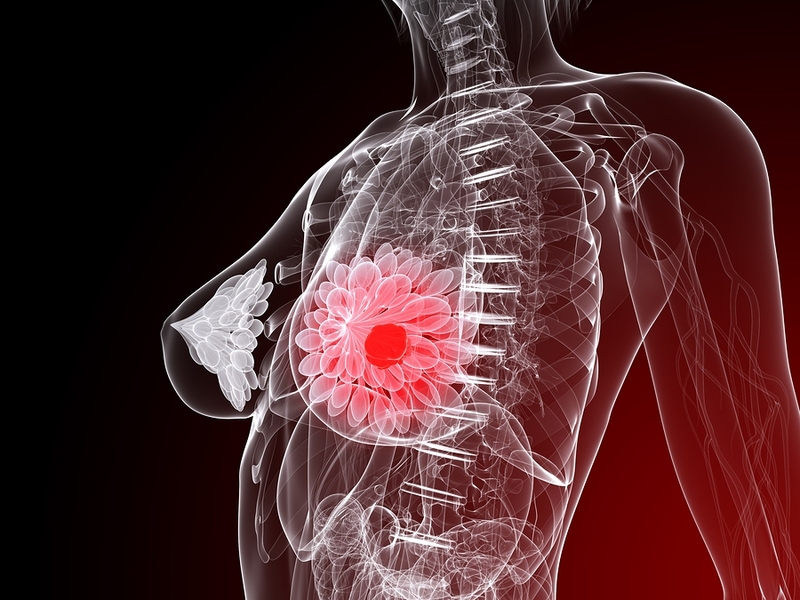 Breast cancer is a glandular cancer of breast tissue, the most common cancer among women. More women die of cancer of the lung because of its poor prognosis, but breast cancer is more frequent and accounts for about 27% of all cancers among women. Each year in the US alone 181,000 women will be diagnosed with breast cancer. In addition to that another 46,000 women are killed by this disease every year. Expressed in another way a woman in the US has a lifetime chance of 1 in 8 women (or about 12%) to get breast cancer (Ref. 1 and 3). Fortunately, breast cancer is a slow growing cancer. Breast self examination every month has been shown in combination with mammography in women beyond the age of 50 years to lead to an early diagnosis of this disease and a high cure rate in a lot of women. A localized breast cancer has a 5-year survival rate of 92%. If women are conscientious about regular monthly self breast examinations, the breast cancer is usually caught at stage I where breast conserving surgery (=lumpectomy) rather than the more invasive, disfiguring modified mastectomy can be utilized. This fact has now been widely publicized in TV shows and magazines and acceptance of breast cancer screening among women is rising thus improving the cure rates for breast cancer. 1. Cancer: Principles &Practice of Oncology, 4th edition, by V.T. De Vita,Jr.,et. al J.B. LippincottCo.,Philadelphia, 1993.Vol.2: Chapter 48. 2. The Merck Manual, 7th edition, by M. H. Beers et al., Whitehouse Station, N.J., 1999. Chapter 177. 3. Cancer: Principles&Practice of Oncology. 5th edition, volume 1. Edited by Vincent T. DeVita, Jr. et al. Lippincott-Raven Publ., Philadelphia,PA, 1997. Chapter 36: 1541-1616. 4. BS Herbert et al. Breast Cancer Res 2001;3(3):146-149. 5. BS Herbert et al. J Natl Cancer Inst 2001 Jan 3;93(1):39-45.